Start by clearing as many targets from the board as you can. The more targets you remove the easier it gets to clear the reel for free spins. Take your time, survey the board and determine how to make as many free spins as you can. You may find it easier to focus effort on one set of Starstones before moving on to the next. Don't get side tracked destroying targets! The goal is to connect the stars so as soon as you have cleared enough space make that your objective. You connect stars by creating a chain of the same color with each star - just as you would make a long chain to create a burst gem. This level is pretty generous with wilds, be alert for any that drop in the central column of the reel - and use them wisely! 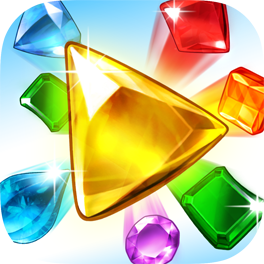 Create a Super Wild Gem by using a wild that matches three different colors, and then match it to trigger all gems of the matched color on the board. If you do this with a green or blue it will connect the Starstones! (check out the Level 637 help page for an example on how to make a super match).